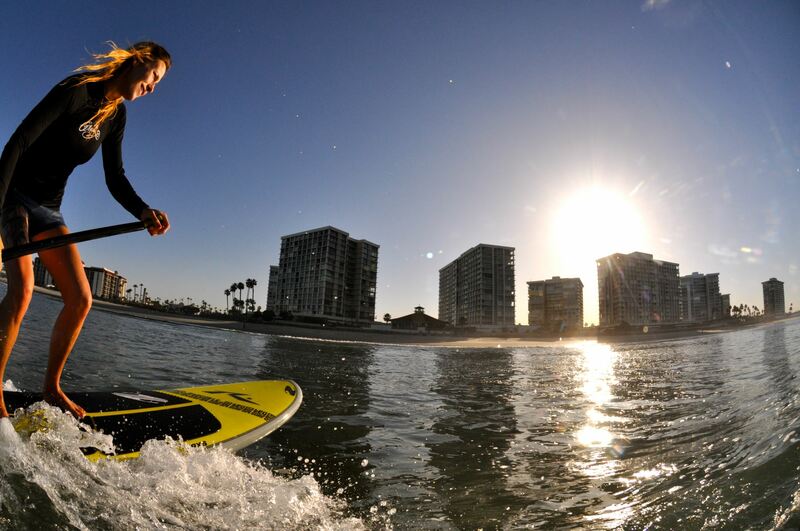 San Diego is crazy for paddle sports, and Standup Paddleboarding or SUP is the latest local craze. Kayakers and surfers have combined the best of both sports to create a fun and energetic new way for people of all ages and abilities to enjoy the water anywhere they go. As the name implies, in SUP, you stand upright on a surfboard and use a paddle to power yourself around. Today, experienced SUP surfers are riding waves at virtually the same performance level as traditional surfers, while recreational enthusiasts are using them for leisurely tours of flatwater lakes and bays. There are open ocean SUP races, SUP yoga classes, even adventurous athletes who are using SUP boards to challenge whitewater rapids and make long-distance expeditions. Part of the appeal of SUP is that it feels more natural to stand than lay prone on your belly, and that you spend more time high and dry and cover more ground. Fitness fanatics can get a great all-around workout. Paddling uses the arms and upper body, while the demands of balancing the board exercise the legs and core. Start on your knees, holding the paddle in both hands, and standup in a smooth, even motion. Keep your knees slightly bent and your feet slightly apart. Use small corrections of your hips and knees to keep your center of gravity directly over the board. Momentum is your friend. It’s far easier to balance and maneuver when your board is moving through the water. Learning to Standup Paddleboarding is a lot like learning to ride a bike: once you get the hang of it, you never forget. This entry was posted in Golf & Sports and tagged outdoor recreation by Todd Lynch. Bookmark the permalink. It is really addictive once you get out on the open water. Great exercise too.